On-Site Wellness Clinics « They Said What? Proof that wellness can be both useful & fun. People think this site is all about “outing” scoundrels, but we’re just presenting facts, usually in the form of screen shots, that can’t be denied. That’s why none of the organizations or people “profiled” have ever sued us, despite our entreaties. However, sometimes the facts are actually good, and we want to recognize that too. For this posting let’s set aside policy/economics issues and just focus on on-site execution of screenings. I attended a Health Advocate biometric screening which was being held in my neighborhood, to attract potential customers, meaning the attendees were comped but had been invited on the hopes that they would set up a screening event. The first thing they got right was the list of tests. The manager on site, Rich Prall, listed the usual tests. I then asked what other tests they had available. As you know, many vendors “profiled” on this site push completely inappropriate tests, that even if they were free would cause more harm than good. We have three more vendors in the queue too, each worse than the previous one in pushing tests that the US Preventive Services Task Force specifically says not to do. Mr. Prall listed the same bunch of tests that the USPSTF recommends not doing, but then volunteered without being prompted that the right answer was indeed for an employer not to do them. (“If you do them at all, it should be at the doctor’s office. What’s an employer going to do about your potassium level, anyway?”) So Mr. Prall was willing to sacrifice revenues for integrity. Literally, this is the first time we’ve seen that happen. What Mr. Prall was appropriately shying away from, other vendors call their “Gold” or “Platinum” packages. Next, I did some height/weight stuff. They had a device that measures body fat (and BMI, which of course is a bit squirrelly as a measure, but leave that aside for now). The body fat measurement was almost 20%. I am usually 2-3 points lower. It could have been the inaccuracy of the machine or perhaps because this winter’s weather has crimped my workout routine, but I expressed a little concern. The screener said: “Actually as you get older (I’m 59), you want to have a little body fat.” That is, once again, the right answer,an answer which shockingly few vendors are aware of. Finally, I did the fingerstick. The screener explained it all very thoroughly, understood the distinction between fasting and non-fasting, and did everything quite well. Unlike Vik’s experience with Provant’s six-week delay, he ran the numbers right on the spot. Even though a finger-stick is not particularly accurate, my values were what they usually are, except cholesterol. My cholesterol, at 127, was 30 points lower than usual. I expressed concern that a cholesterol value could be too low, and the screener said he didn’t know what too low was, but didn’t think it was an issue at 127. So I googled it, and indeed there is a “too low,” but it is south of 127. Apparently people with too-low cholesterol tend to do impulsively self-destructive things, like attempt suicide or drive recklessly. I’ve never done anything particularly impulsive/self-destructive, unless one counts running this blog. So, once again, the Health Advocate person was right. That was 3 in a row, which might be a record for wellness vendors. So I idenitifed myself (I hadn’t misrepresented myself earlier–remember, Vik and I are in the “integrity segment” of the market — but I just hadn’t given the full story) and congratulated them on best-in-class job of screening. Literally every other vendor on this site could learn a lot from Health Advocate. I know I did. Case study of Mt. Vernon Mills, in which Healthstat reports more than $2000/person/year in savings through risk reduction and mitigation. You are claiming savings well in excess of $2000/person by Year 5, including fees. Since the average person only spends about $2000 on total hospitalizations (excluding birth events), wouldn’t this mean that you wiped out hospitalizations? The average person in an older workforce only spends about $200/year on wellness-sensitive medical events, offset by program fees and preventive expenses. How are you able to save $2000/year when there is only $200/year available to be saved from totally eliminating these events? What is your wellness-sensitive medical event rate for this population? If you don’t track it, why don’t you track it? Is it possible that since instead of comparing rates of wellness-sensitive medical events that you compared forecasted costs to actual costs, that mis-forecasting the costs is responsible for most of the improvement? You displayed the “top 20%” and “top 50%” to show their improvements. Would it be the case that had you displayed the bottom 20% and bottom 50%, their readings would have deteriorated over the period? How did you account for dropouts and non-participants, who presumably would not have shown good results and whose wellness-sensitive medical events might have increased? 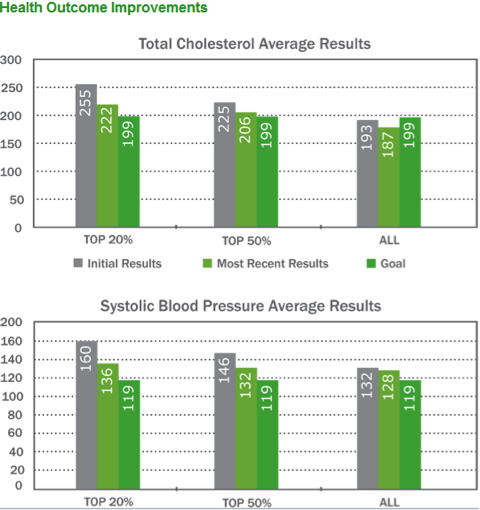 How can you reduce costs through wellness programs by $2000/year if cholesterol and blood pressure barely improved, even without offsetting those improvements with dropouts and non-participants? Your questions do talk about wellness and savings, but do not necessarily focus on how our business model works. Therefore, they don’t make sense for us to answer them in the way they are presently written. We work with an insurance free onsite employee wellness center model that is HRA and preventative wellness driven. Our cost savings are calculated from an insurance premium cost estimate for self-insured companies, as well as preventative treatments for those potentially at risk for more costly services. Based on your website, and also your email, you say you have a model that is “an employee wellness center” that is “preventative wellness driven” and you provide “preventative treatments for those potentially at risk.” The questions are therefore quite pertinent in regard to your business model and boil down to one: How does your “preventative wellness model” reduce wellness-sensitive/risk-sensitive medical events by $2000/person/year, when most companies only spend $200/person/year on wellness-sensitive medical events in the first place?